Directly overhead as darkness falls can be seen the distinctive shape known as the Summer Triangle, which consists of the stars Vega, Deneb and Altair. 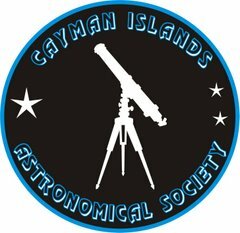 This noticeable pattern is known as an astronomical asterism, a group of stars seen in Earth's sky which is not an official constellation. 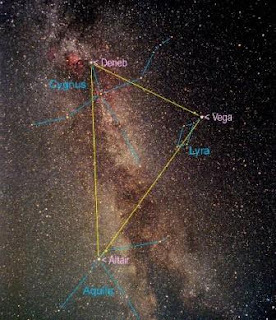 The triangle connects the constellations of Aquila, Cygnus, and Lyra. The largest of these three constellations is Cygnus, the Swan, also known as the Northern Cross. Cygnus contains several bright stars. Deneb, α Cygni, is an extremely brilliant star, very prominent despite its distance (3230 light years). The blue supergiant forms the swan's tail, the upper end of the Northern Cross. It’s also the 18th brightest star in the sky. Albireo, β Cygni, is at the swan's beak. It is one of the most beautiful double stars of the sky, a golden star easily distinguishable in a small telescope from its blue companion. Lyra, dominated by its bright star Vega, is a much smaller constellation than Cygnus. Vega is the second brightest star of the northern hemisphere (after Arcturus) and the fifth brightest star in all. It lies at a distance of only 25.3 ly. It was the first star to be photographed. Aquila is a much harder pattern to distinguish, although Altair is easy to spot. Altair is located 17 light years away from Earth (about 159 trillion kilometers) and is one of the closest stars visible to the naked eye. Behind the Summer Triangle lies some of the vast star fields of our Milky Way Galaxy, containing literally billions of stars. The dark band across the middle that seems to divide the stars is actually interstellar dust, which absorbs more visible light than it emits and so appears dark. Jupiter is the only visible planet in the evening sky this month, shining bright in the south west. Autumnal equinox falls on the 23rd, when the Sun can be observed to be directly above the Earth's equator. Night and day are nearly of the same length, and this signals the end of the summer months and the beginning of winter.